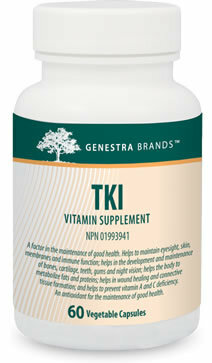 TKI Renal Complex is indicated for chronic cystitis, enteritis, edema, bladder and kidney stones, kidney and urinary tract infections, nephritis and incontinence; for overall kidney detoxification; and to assist with the normalization of pH levels.The capsules are 100% pure vegetable-sourced. Elevated sodium, sugar and caffeine intake, lack of dietary fiber, and heavy metal toxicity can impair proper kidney function. TKI Renal Complex provides a combination of vitamins, herbs and kidney tissue extract, specifically formulated for the support of the kidneys and urinary system.The kidneys play a key role in detoxification and homeostasis. Recommended Adult Dosage Take one capsule two times daily with meals or as recommended by your health care practitioner. Guaranteed to contain no added wheat, starch, yeast, gluten, corn, soy, sugar, artificial coloring or flavoring, preservatives or dairy products.